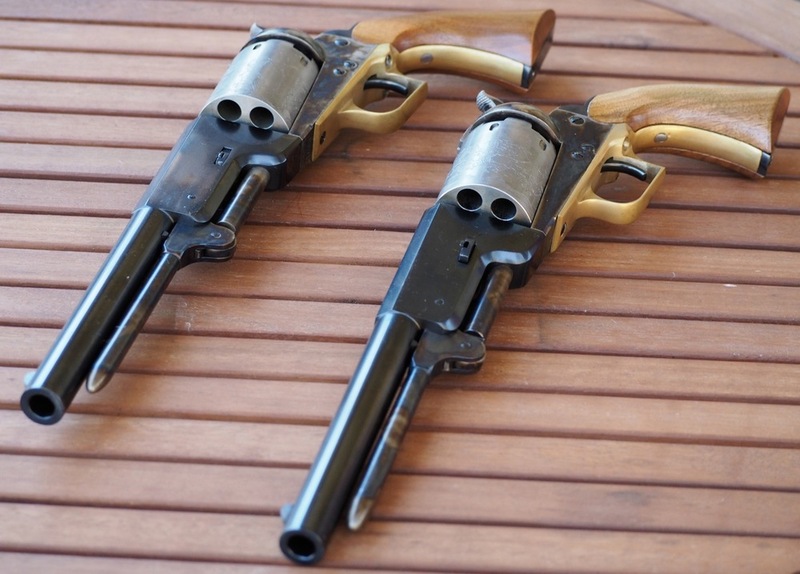 Goons Gun Works offers a full service-tuning package for both open top and framed revolvers. As a result of Goons services, clients see a tremendous amount of improvement and efficiency in their target and competition shooting. 1. Correct the arbor length and bed the arbor - This allows the revolver to work as a solid unit instead of two assemblies held together. 2. Set the barrel/ cylinder gap to .002-.0025 - This eliminates the debris, which causes the cylinder to bind. The smaller the gap, the longer you can shoot without binding. 3. Sculpt the bolt head - This allows for earlier entry into the locking notch and will protect the notch from damage. Sculpting also reduces weight and increases efficiency. 4. Installation of a bolt block - Creates a solid lock up and helps to prevent throw-by. 5. Installation of an action stop - This feature prevents over-travel of the hammer and keeps the hand from being forced against the ratchet after lock up. 6. Installation of a cap post - This keeps spent caps and/ or fragments out of the action. It also restricts any blowback past the post, which allows for a much lighter "cartridge" type action (Colt and Colt type safety pins are not affected). 7. Harden and fire blue the screws and screw pins - Not only will they look better, but also action parts will have less friction due to the heat-treating. 8. Individually tune springs - It is important for springs to work efficiently. Most springs are over stressed. Goons Parts Enhancements: Goon enhances the performance of the parts in your revolver that result in even better efficiency. This service is far beyond what is expected from any "normal" tuner. These enhancements are proprietary to my service and thus are not listed. -Remove and replace the barrel with a straight on and off motion. Do not twist, as this could upset the arbor bedding. -Trigger guard removal/replacement: The action stop is located on the trigger guard. This must be installed the same way every time or timing may be affected. · When removing: Loosen the front screw (removes torque), then remove the 2 rear screws. · When reinstalling: Install the front screw but DO NOT tighten (leave about a turn before it touches). Doing this first, helps you to align the 2 rear screws. Tighten the rear screws (doesn’t matter which one first). This locates the stop. Then, tighten the front screw, this torques the rear screws and the guard is installed in the tuned position. -Arbor set screw: The arbor has a set screw in the end which acts as the front bearing for the wedge. This gives you an adjustable bearing and allows you to compensate for wear to the wedge. See instructions for break-in. -The combination trigger/ bolt spring (as well as the main spring) has a SPACER UNDER it. It looks like a washer, but it is in fact a spacer, which reduces the tension so each side can be tuned individually. Remember: The SPACER goes UNDER the spring. *If the timing ever seems “off,” make sure the hammer screw, trigger and bolt screw pins are tight. These are very close tolerance machines now and everything makes a difference. -Load as normal (shoot your normal charge) and pay close attention to the wedge after the first 2 or 3 shots. If it loosens, push the wedge in further to maintain a tight fit. If you carry an Allen wrench with you at the range, you can adjust the set screw (44 cal.-1/8” or 36 cal.- 3mm) otherwise, just push or tap the wedge in to maintain a tight fit. This movement is expected and will stop during the break-in stage. You may not experience any movement at all, as these guns are as individual as you and I. -The barrel/ cylinder gap is an easy sign that the wedge has moved. Even though the arbor fitment defines the gap, the wedge keeps them together.